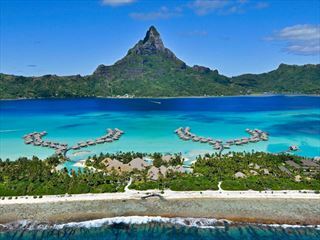 Secluded and sophisticated, the Four Seasons Resort Bora Bora is an idyllic retreat located in the shadow of Bora Bora's Mount Otemanu. 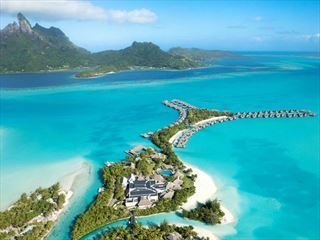 It is on a private motu (island) making it all the more exclusive and luxurious. The resort oozes understated luxury, with beautifully appointed one, two and three bedroom beach villas, together with their signature overwater villas. A completely stunning resort in every way, superb for families with an excellent kids club and plenty of activities. 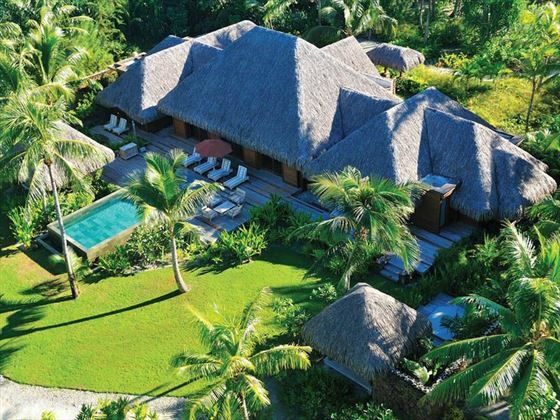 Let the kids experience a taste of the South Pacific with cultural activities including hermit crab racing, whilst mum and dad enjoy yoga by the lagoon, or a relaxing afternoon under the thatched pool cabana. The food here is decadent, with sumptuous views to boot, including Tere Nui overlooking the volcano, and the laidback Fare Hoa Beach Bar and Grill where you can enjoy zesty drinks with your toes in the sand. 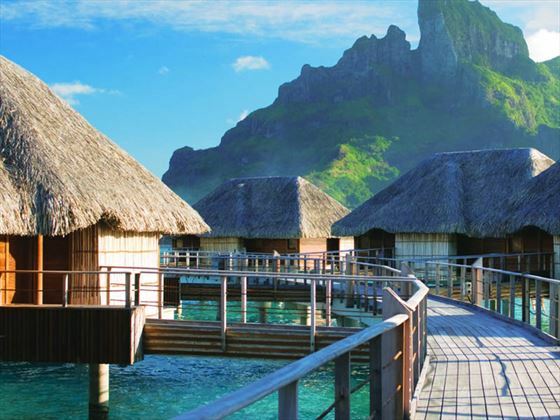 This beautiful resort is located on its own private island in Tahiti. A short and stunning 50 minute flight from Papeete and a 15 min boat transfer and you have arrived in Pacific Island paradise. All accommodation is luxurious, well appointed with no stone unturned to ensure your total relaxation. 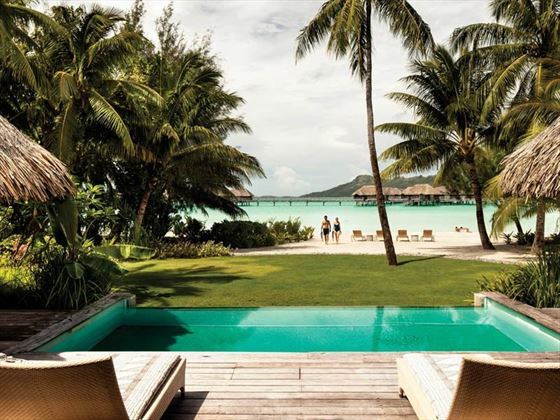 Three Bedroom Beachfront Villa - Experience Bora Bora's unmatched sunsets from this villa, ideal for families and groups with its private pool, indoor-outdoor floor plan and secluded beachfront setting. You have access to a villa personal assistant throughout your stay. This is an astonishing place to stay. Two Bedroom Premier Beachfront Rooms - Equally as stunning are the two bed options, tucked along the white sand beach with enclosed gardens, hammocks and pools. Two Bedroom Deluxe Beachfront - Set in an enclosed garden with a private pool and a large terrace, these spacious indoor-outdoor villas are perfect for longer stays and group getaways. 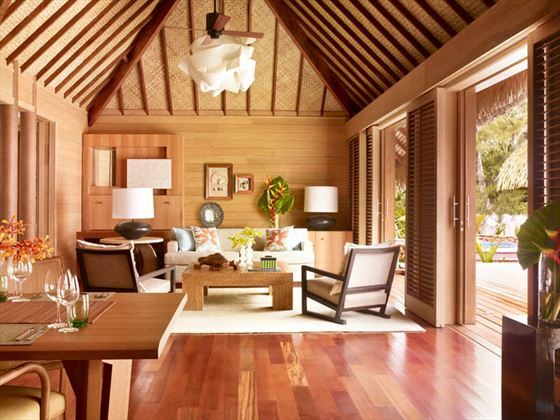 One Bedroom Beachfront Villa - Surrounded by lush coconut and tiare (Tahitian gardenia) trees, these romantic villas offer incredible views of the lagoon and Mount Otemanu. All Overwater Villas allow direct access to the aqua lagoon waters. 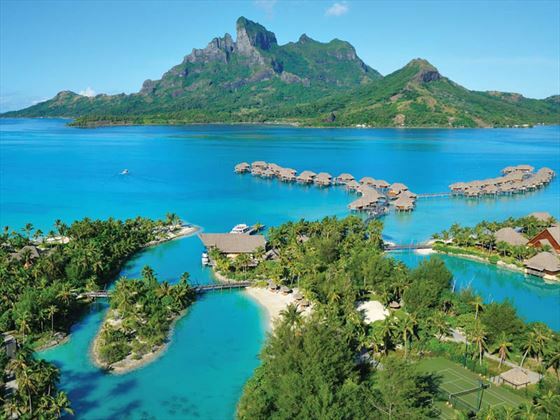 Two Bedroom Overwater Bungalow Suite - Poerava or Herenui - Both types are huge, with different bed configurations including Two King Rooms or One KIng Room and a Twin Queen Room. Boasting unobstructed views of the lagoon. 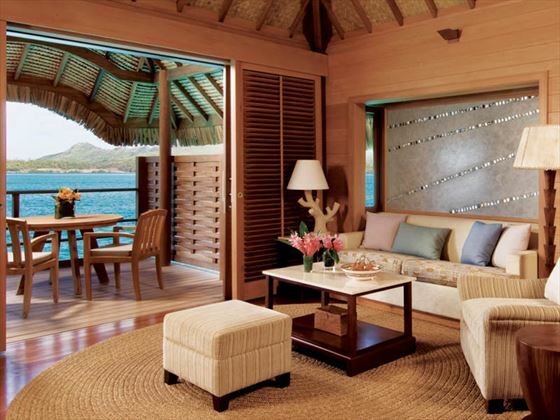 One Bedroom Otemanu Overwater Suite and Overwater Bungalow - Each type has their own plunge pool and are well set apart. 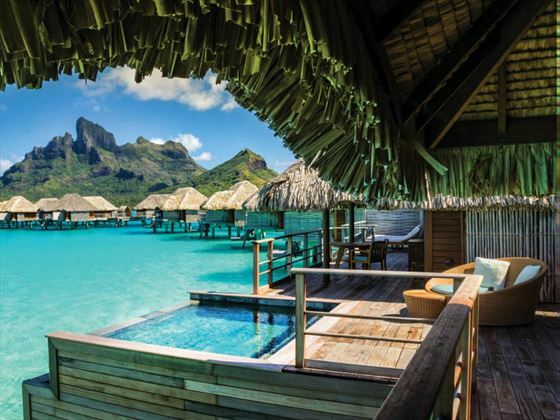 Both offer gorgeous views of the lagoon and mountains, the difference being that the Otemanu Overwater Suites have views of other villas whereas the Overwater Bungalows have unobstructed views. Arii Moana - Divine Polynesian and French infused dishes enjoyed beneath a thatched roof by the waterside. Fare Hoa Beach Bar and Grill - Sand in your toes, casual all day dining restaurant with tropical cocktails and nightly live music. Tere Nui - Overlooking Mount Otemanu, this is where breakfast is served in an open air setting. Sunset Restaurant and Bar - Great views, drinks and Asian nibbles, the perfect start to an evening. Tamarii Club - a kid's club for children aged 5-12 years old, offering a playroom, an outdoor playground, video games, and cultural activities including coconut painting and hermit crab races.